At the start of the year, I wrote a wire called 'Would I lie to you? The 6 company mistruths to be wary of...' on the 'overly optimistic' figures from company management. The companies I called out are now down 25% on average, but there is one outlier on the list that has done quite well. The one stock that has bucked the trend has been Livetiles (ASX:LVT). Admittedly, I have been negative on this stock (and wrong) for a long time. Indeed I owe a stockbroker a fancy lunch for being on the wrong side of LVT’s galloping stock price – which may cost me more than having actually been short the stock. LVT is a New York based Australian software company closely aligned with Microsoft. LVT’s software is subscription based and sits over the top of platforms such as Microsoft’s Sharepoint, making its interface more user-friendly. (I think anyone who has used SharePoint can see the advantage of that). Hence my hesitancy does not stem from the utility of the end product, it simply comes from old-fashioned number crunching. After their $25m placement today LVT will have almost 550m shares on issue, valuing the business at more than $350m. Despite last month LVT boasting that “annualised recurring revenue (ARR) reached $15.0 million as at 30 June 2018, up 275% in FY18”, actual revenues, according to the 30 June 18 cash flow statement, amounted to $6.9m, credibly up 155% on the prior year, but certainly less impressive than the headline numbers suggest. Even more astonishing was the company’s costs in FY18, totaling a whopping $22.5m (versus $8m in FY17). It’s no surprise then that the company is coming back to the market, cap-in-hand, just 6 months after raising $23m. This company is like the proverbial monster; the more you feed it, the more it eats. Now, I may continue to be wrong on this company, but my abacus says that a business burning through almost $18m a year, and producing revenue of just $6.7m... is not worth $350m. As always, the market will decide. Cyan is making meaningful investments in some of the most promising (and often overlooked) smaller companies listed on the ASX today. Find out how. Enjoyed that one Dean, thanks for the follow up article. Sounds like a small version of Tesla. Actual FY17 revenue was $1.769m if they hit FY18 revenue of $6.9m that would imply a growth rate of 290%. Also in a fast growing company like this, revenue will lag ARR by approximately 6 months. Hi Dragan, I've been crunching my numbers from the 4C cashflow statements which do differ from the revenue figures in the P/L. 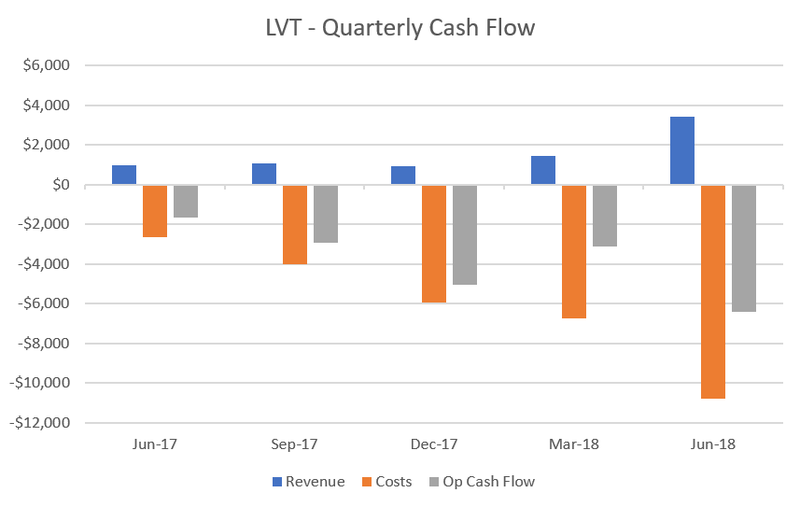 Given the 4C in FY17 was $0.9m above the P/L revenue, it will be interesting to see what discrepancy there is in FY18 when LVT's P/L is reported in the coming weeks. Dean - after reading an article like this and also others along a similar line, I wonder if there’s another “tech wreck” around the corner. Shares prices and market cap defying gravity, cash flow break-even and profitability not obvious, etc.